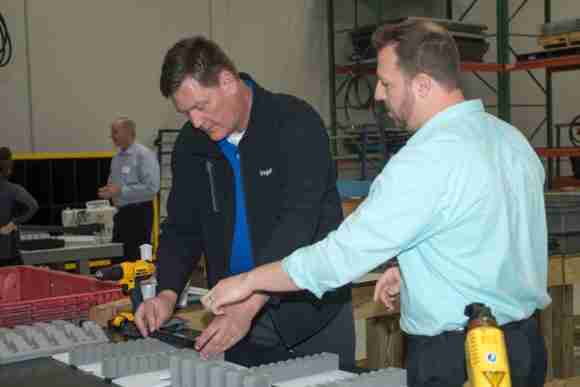 ORBIS® Corporation, an international leader in reusable packaging, hosted an open house at its new ORBIShield Innovation Center on March 15 in Spartanburg, South Carolina. Automotive manufacturers and suppliers gathered at the new facility to learn how the regional dunnage design and prototyping center will increase collaboration and reduce design time. Dunnage is often placed within material handling packaging to compartmentalize and protect products when traveling along the supply chain. ORBIShield® is the ORBIS line of dunnage and is custom designed with a variety of foam, sheet, specialty and fabric materials. These materials are available at the ORBIShield Innovation Center for use in custom designs. The center’s employees work one on one with customers to create a dunnage system design specific to their needs. Concept: The customer and ORBIS team meet to discuss project details and needs to determine the best approach forward. Design: Specifications such as materials and dimensions are discussed so the ORBIS team can create a CAD drawing for customer review. Quotation: Budget and timing estimates discussed. Prototype: Prototype is created and customers return to the center to see the design firsthand and determine alterations, if needed. Evolve: Modifications are made quickly — sometimes as fast as 10 to 20 minutes — to provide customers part-protection solutions sooner. By following these steps, automotive suppliers and manufacturers will have more damage-free parts, resulting in higher consumer satisfaction and less waste. And by having a design and prototyping center in South Carolina, Hub City has a reliable source for custom dunnage. Visit orbiscorporation.com to learn more. If you are attending MODEX, April 9-12 in Atlanta, visit ORBIS at Booth B3735.